A carpet of bright groundcover plants secure this terraced hillside. 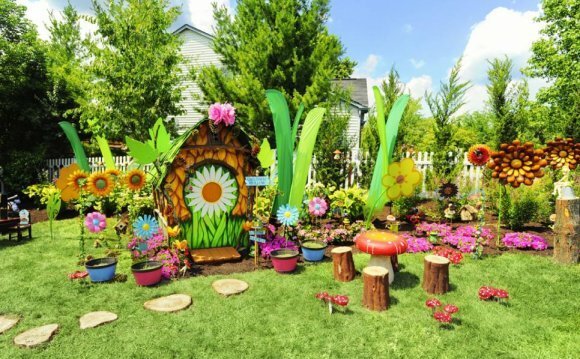 An exuberant flower garden leads the eye toward a beautiful garden retreat. RMSer lross7577 says that "Toad Cottage, " formerly a storage shed, underwent a total renovation, complete with a gas fireplace, bluestone patio and fire pit. The play of light and shadow enhances this private backyard oasis amid lush plantings. Jamie Durie used Sonoman design details — including Mexican roof tiles — to create this richly hued outdoor space. Colorful drought-tolerant plants complete the look. A cottage-style garden welcomes visitors to HGTV fan Sunny777's home. A pond, stream and bridge are enhanced by annuals and perennials in this backyard design by RMSer Tdnuss. This backyard renovation included the installation of a 100-foot stream down one side of the property and landscaping meant to give the feeling of a woodland escape. Says RMSer lross7577, "We don't have to travel far from our suburban home outside the city of Minneapolis to get a wonderful cabin retreat experience. We just walk out our back door." High-contrast plantings, using opposites on the color wheel (yellow and purple), create a vibrant look and play off the neutral tones of the hardscaping and furniture. This semi-shade garden features a range of green tones and leaf shapes, including wild ginger, rodgersia and sedge. The result is a soothing green palette, accented by the blue-gray hardscape. Develop a long-range plan for your garden and include the height and year-round structure provided by conifers and trees. As they grow in stature (and often change hues throughout the seasons), you'll have a framework for your perennials, shrubs and bedding plants. White forget-me-nots, tulips, daisies and money plant combine with hostas and silvery astelia foliage in this spring garden. The sculptured wall and strong lines of this design create the structure for this gorgeous cottage-style planting bed. Designed as a show garden for the Chelsea Flower Show in England, this sustainable garden by Stephen Hall includes a range of diverse habitats for wildlife and plants that attract beneficial insects. The building's green roof is planted with sedum. Early summer in this garden brings the pinks and mauves of roses, geraniums, delphiniums, clematis and centaureas. As fall approaches, the palette deepens to the cerise, deep blues and purples of asters, phlox, dahlias and aconites. Hollyhocks add a vertical element to this beautiful garden spot, posted by RMSer horselady. Lush plantings turn this sitting area into a picture-perfect garden oasis. Posted by RMSer nwphillygardener. Rudbeckia and phlox join the daylilies and daisies to create a riot of color in RMSer chefboston's front yard. A stark contrast with the wild abundance of the cottage-style garden, this topiary garden requires frequent trimming during the growing season. A pergola helps frame the walkway through this garden. The easy-to-navigate brick path allows maximum appreciation of the surrounding garden. To slow down the transit through your garden, narrow the path a bit. For bike traffic, keep the walkway wide and the inclines gradual.